A few days ago I asked my followers on Instagram what I should do with the massive pumpkin I got. I received quite some nice suggestions, also from people in real life who had seen it. One of them was a healthy pumpkin tart, preferably raw. 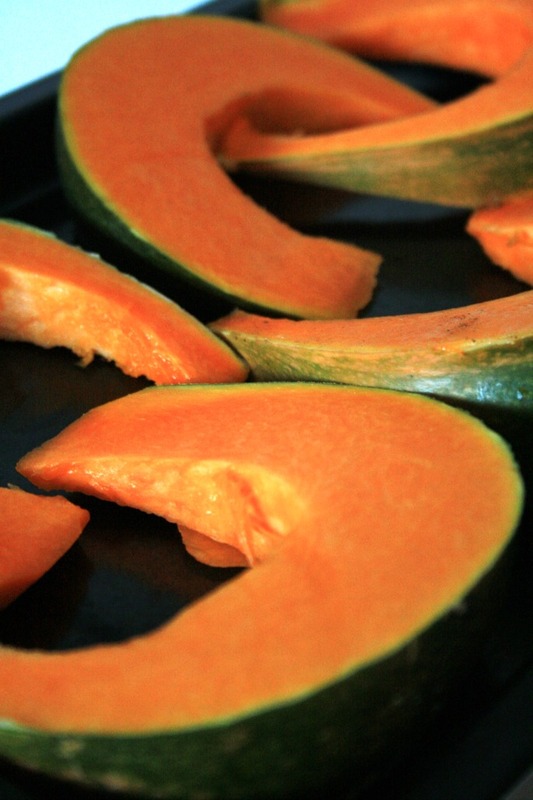 Unfortunately I have no clue how to work with raw pumpkin, and when I tasted it I could not enjoy it, so I decided to make it semi-raw: everything raw, except for the pumpkin itself! I also added a few tablespoons of coconut milk, which is canned. I love the textures in this tart, but they are quite odd. 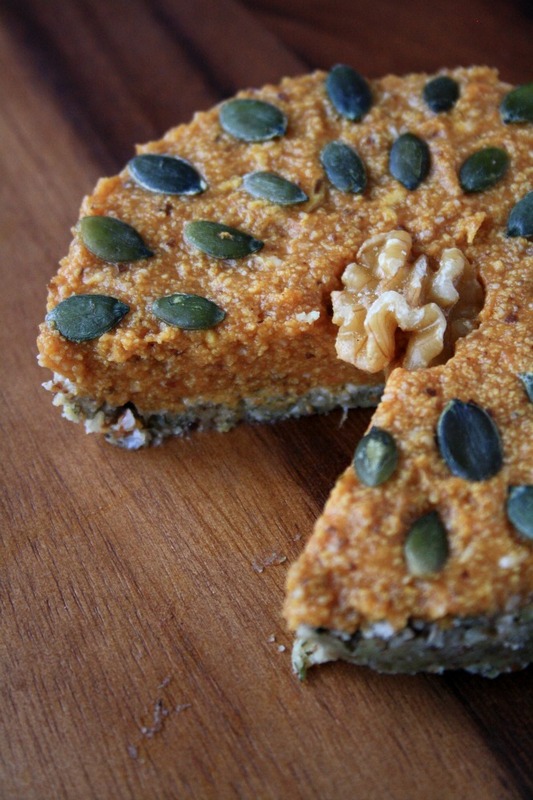 The 'crust' is very rich and incredibly delicious, it is filled with the most lovely flavors of nuts, seeds, and dates. The top layer is extremely creamy, and also very soft. It is in no way like a cheesecake, it only just holds it shape. Personally, I love it. 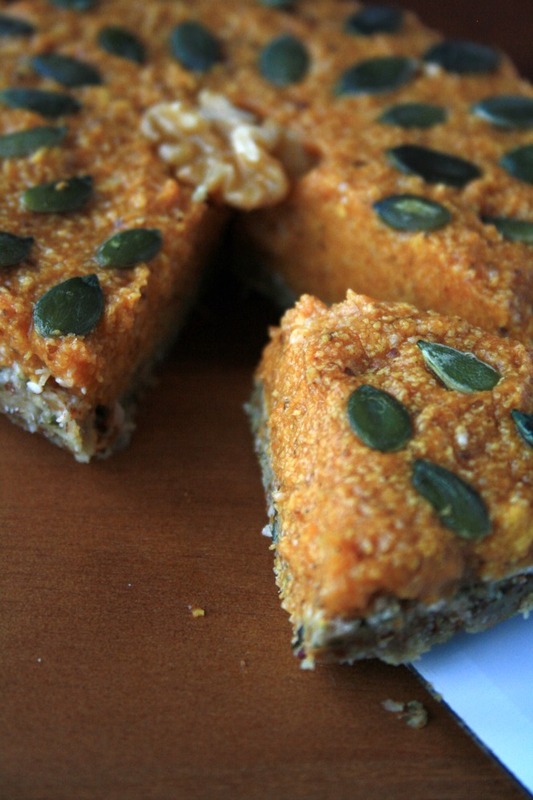 The tart is super sweet, but contains no added sugar whatsoever; all of the sweetness comes from the pumpkin and a few dates. I also used some extra pumpkin seeds and a walnut half for decoration. 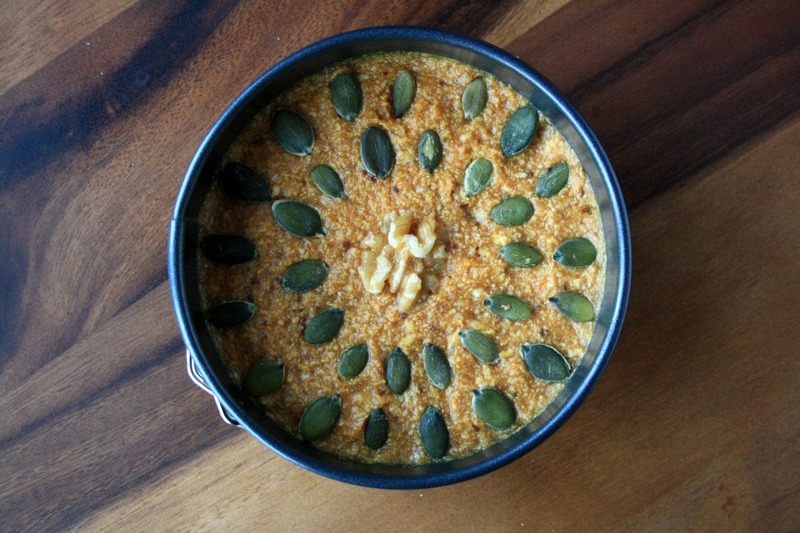 Using canned pumpkin puree is absolutely not a problem! In the Netherlands, however, it is nearly impossible to get your hands on it, so we are forced to make our own. 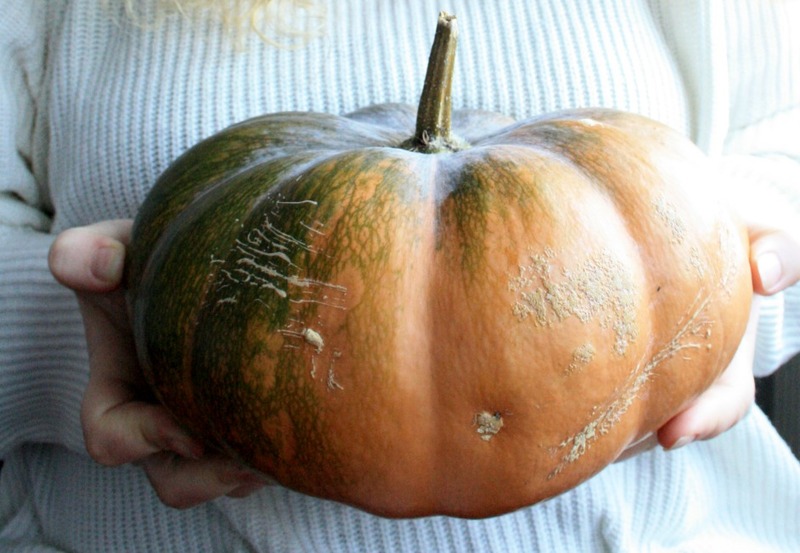 To make it, cut a pumpkin in half, and scoop out the flesh and seeds. Just throw this away. Slice the pumpkin up, and bake in a 350 degrees F or 175 degrees C oven for approximately 50 minutes, or until the flesh is nice and soft. Peel the skin off, and put the flesh into a food processor. Add a dash of salt, and blend until smooth. Refridgerate until cool, and also keep in the fridge if you do not use all of it right away. Line a little tart form (or 3 cupcake forms if you want to make individual tarts) with parchment paper on the bottom. In a food processor, mix together all of the ingredients for the crust: coconut oil, dates, flax seed, pumpkin seed, almonds, walnuts, and salt. 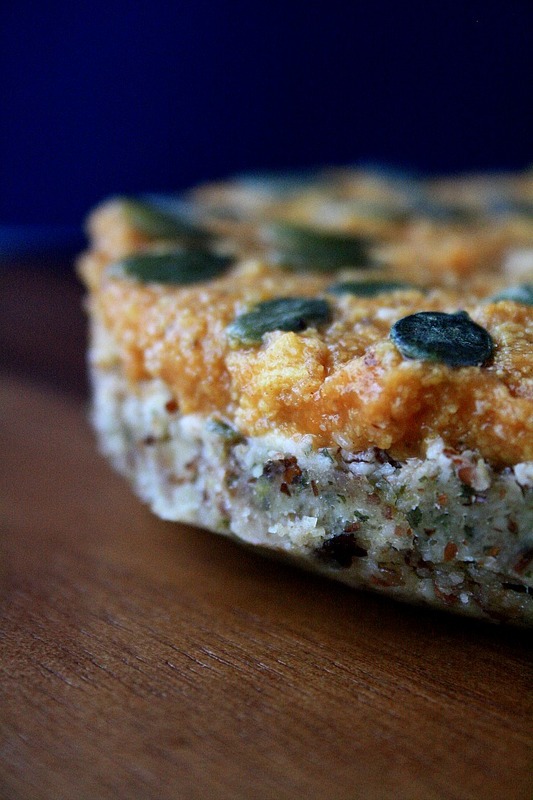 Spread out over the bottom of your tart pan, and put into the freezer or fridge to set while you work on the top layer. Rinse your food processor, and do the exact same thing as you did with the crust: throw all of the ingredients in, and mix until completely smooth. Spread out over the crust, and put back into the fridge. Refridgerate for at least 2 hours before serving. Enjoy the lovely flavors of fall! I honestly believe food can change lives. I adore creating and designing new vegetarian recipes, sharing lovely desserts with friends and family, and taking pictures of colorful plates filled with fresh, seasonal products. Want to be inspired? Feel free to look around and contact me! Copyright Veggies & Vanilla, 2014. Powered by Blogger.